... EPS should become widely circulated as one of the leading international scientific journals in the area of Earth, planetary and space sciences by the end of the 20th century. This goal set by Dr. Honkura for EPS has already been redrawn a higher level, pursued, and achieved in 18th year of the 21st century. EPS became a full open access online journal in 2014, and its visibility has increased significantly. 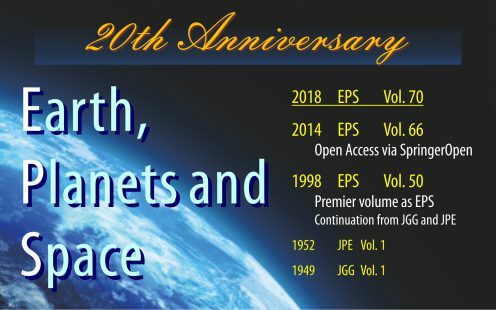 All articles published in the past and current issues can be freely accessed, including numerous highlighted papers, and special issue papers focusing on important observation / research projects or on sudden events associated with earth and planetary science. It is indeed a matter of pride for us that many articles published in EPS are referred, leading development of the field. EPS thanks all its contributors from across the world for their article submissions, proposals for special issues, and peer reviews, and welcomes further contributions in the future.